I have never done much of the distressed look for my cards, but I am certainly enjoying it. Zutter's Distresser machine did all the distressing on each layer of the card. What a fabulous job it does. 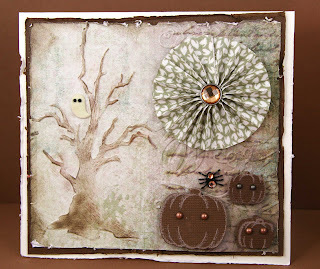 Tim Holtz's Branch Embossing Die was used for the tree. Notice how deep it embosses. The tree was then sponged with Walnut Distressed Ink. Elegant Words were stamped on the right side of the tree and spritzed with Perfect Pearls Violet Mists to the point it bled. After allowing it to dry, the Cuttlebug pumpkin embossing folder was used on top of the words. All edges were sponged with Tim's Ink blender and Distressed Walnut Stain. Another new tool was used to make the Rosette. Tim's Rosette Die. How fun and so many possibilities. 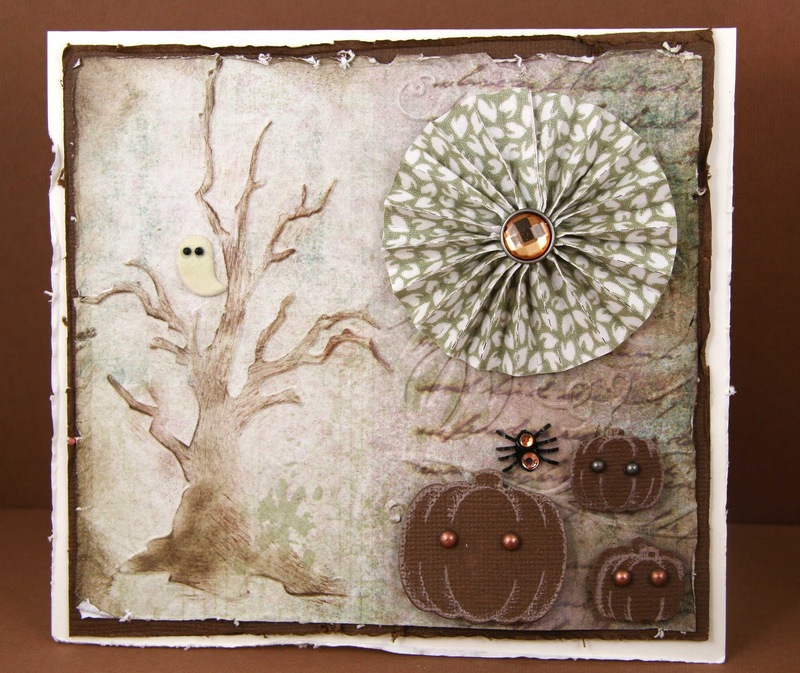 The Pumpkins were stamped using Heartfelt Creations Stamps and Spellbinders Pumpkin Dies. Making Memories Embellishments were added to finish off the card. We worked very late last night finishing up most of the Glue Glider orders, so I did not have a chance to make a new card. The items used on this card fit just what I wanted to do for this week's challenge, so I decided to use it. By all means take a look at Selma's card she created for the challenge. It is so awesome!!!!!! Cute card, Joan! Love the tree and the pumpkins!